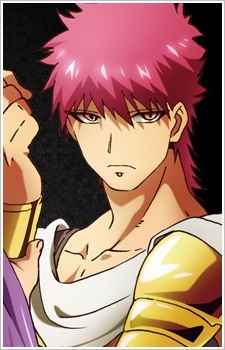 Age: 20 Height: 195cm Likes: naps Weakness: children Birth place: Dark Continent One of the eight generals. He uses the weapon household's vessel "Balalark Kauza." He is also a "Fanalis," like Morgiana. He does not speak a lot usually and is seen as emotionless and unfriendly. However, he is really kindhearted—he just doesn't show it often. His senior, Sharrkan often picks fight with him. However, he only listens to what Sinbad says.